Today, CEOs expect their CMOs to be leaders in digital business innovation and growth. But even though marketing automation is at the center of the marketer’s ability to lead digital growth, enterprise marketers are some of its slowest adopters. 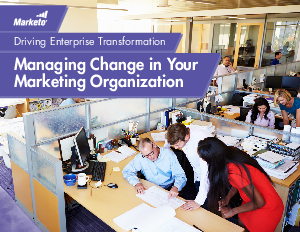 Positioning your enterprise company to take full advantage of technologies like marketing automation can mean making comprehensive changes that affect the entire organization. In this ebook, we’ll give you an overview of what to expect, and how to execute and guide the change management process.